If you’re not sure how to choose a guitar pick or if you didn’t even know that different picks can have a profound influence on the sound you create, and the ease in which you create that sound, then this post is for you. How Much Difference Can a Pick Really Make? That’s a good question – and one that a lot of guitarists ask at some point in time. If you’ve, for example, been trying to play rhythm jangly strumming guitar (if that’s a term?! ), and you’ve been doing it with a thick, stiff pick then you’ll be amazed by the difference a pick more suited to that style will make. The pick affects both tone and technique so it’s important to get it right. There’s not too much to picking a pick – it’s not rocket science – but once you learn a couple of things then you’ll be on track to a better tone, better technique and a more enjoyable experience. Perhaps the most important part of choosing a guitar pick is the thickness of the pick. Guitar picks tend to come in thicknesses anywhere from extra light to extra heavy. There is no universal measurements or names but the table below shows roughly the different thicknesses. Extra Light (extra thin) <0.45mm <0.0178"
Extra Heavy (extra thick) >1.20mm >0.0472"
Of course the tone and feel of any thickness of pick will also come down to the material (more on that later). Extra light picks are great for acoustic guitar strumming for rhythm acoustic guitar. That jangly strumming guitar, mentioned earlier, is much easier with a pick that is either light or extra light than it would be with a heavier (thicker) pick. They produce a more treble dominated tone and a “light” sound and the pick noise against the strings is noticeable. This type of pick is best when the guitar is being used as an accompanying rhythm instrument and isn’t the focus of the music. Again great for acoustic guitar strumming – but it will give a bit more volume and oomph. But will still produce a more trebly tone and there will still be plenty of pick noise – which is often wanted for that rhythm strumming sound. 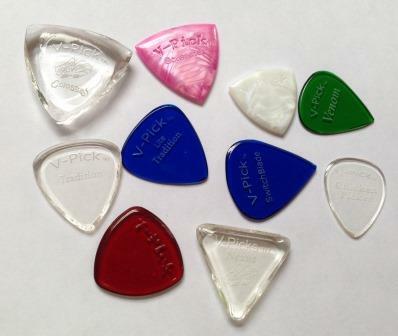 The medium pick is the most versatile of all picks. Though it may not be as good for jangly strumming as the light and extra light – it can still be used for it – and it can transition between strumming and playing lead too (light and extra light don’t typically produce enough oomph or clarity for playing single notes). This pick thickness is great for the solo acoustic guitarist who needs the guitar to play a more dominant role – and where he/she needs the pick to be able to strum and do flat-picking for single note playing. The medium is also better for rhythm guitar for styles of music such as rock which need a more bass heavy driving rhythm than a light or extra light can deliver. A medium pick produces more bass than lighter pick types but they overall produce a good balanced tone of mids, treble and bass. Pick noise starts to disappear at the upper ends of this thickness. Heavy (thick) picks are best for playing leads and are mostly used on electric guitars. In the higher end of the range pick noise is minimal and this helps to really give leads a clean crisp sound. This type of pick will also produce a bass heavy sound. Obviously the more you get into the higher ends of the range the more bass heavy it will be. They will also allow you to get good volume out of those single notes. 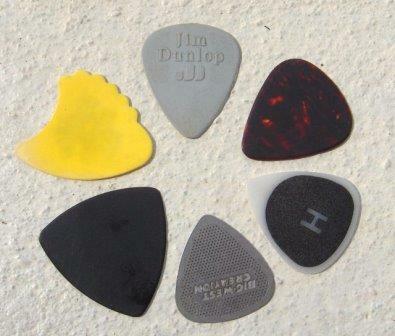 Picks in this extra heavy range are mostly used for jazz and metal and almost exclusively for electric guitars. Jazz players get a very warm tone that is very clean with virtually zero pick noise. This kind of thickness can also get you a very bass heavy sound that many metal guitarist like – it can give you that really heavy driving sound. It will give plenty of volume and clarity for single note playing. After pick thickness, the material used is the next most influential factor of a pick’s sound and feel. The most common pick materials are nylon and various plastics like delrin and ultem (plastics that are designed to emulate the now outlawed tortoise-shell type sound). Less common materials such as stone, wood, leather and even steel are also used for making picks. Check out the article at the link below which goes into more detail about these different types of materials. The different materials will not only change the stiffness of the pick but can also affect how “grippy” the pick feels on the strings. The pick’s shape is probably more down to how it feels to use but can also influence the tone you produce. Smaller, heavier and teardrop shaped picks are typically used by guitarists that need a really precise sound, particularly for single note playing – this is often the choice of jazz and lead guitarists. Larger picks might be more preferred if you are doing a lot of strumming as you are less likely to strike your fingers as often. The texture of a pick can affect the tone as well as the grip of the pick. It’s not a major consideration but for some it makes a difference. For example picks that have raised lettering might make it easier to grip but can also produce a different tone when run against the strings. I hope this post has helped you to determine the type of pick that is right for you. The best thing to do is experiment with different picks. Try some different materials, some different shapes and some different thicknesses and narrow down what you prefer the most. Picks are typically super cheap (though some are more expensive than others) – so you could try 20 different picks and only pay around 10 bucks. That’s a small price to pay to find the perfect pick for your individual needs – it can make a huge impact on your tone and on your technique – not to mention your enjoyment. Of course you might find you like different picks for different purposes – again you can discover this as you experiment. Excellent post, it’s amazing how such a small piece of gear can influence the overall tone of your guitar. Experimenting with different picks is definitely the way to go, but also adds a variety of tones at your disposal. Thanks for sharing! Thanks for your input. Yeah it always amazes me the difference that such a small inexpensive part of your guitar weaponry can make such a difference. Yeah definitely good to have multiple picks, not only to experiment with but also, like you say, so you can have multiple options for different sounds that you may want to get for different songs, for different parts of a song and on different guitars.